One of the points of difference between a blog and a regular website is that it supports the development of communities and enables conversation through the ability for readers to post comments. I would be delighted if you would like to post a comment – please note this a conversation between and among all of us, not just between you and me, so be aware of what you post. To protect your privacy, please do not post phone numbers, email addresses or private information in the body of your comment. 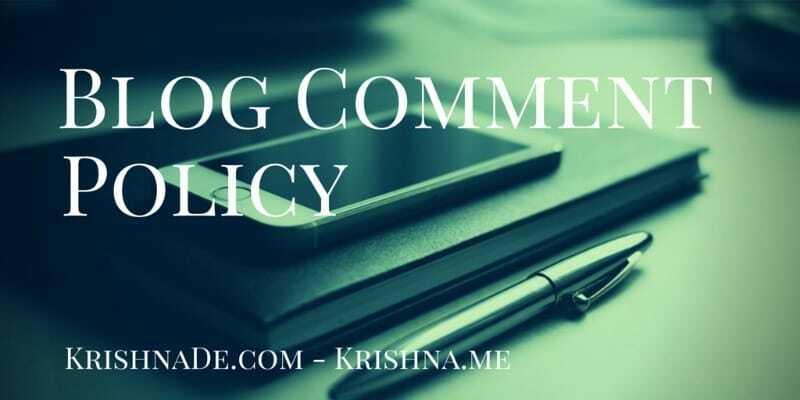 This blog is not a place to promote your services or products to readers – I reserve the right to edit or delete spam comments and trackbacks, terms that may be offensive to others, or comments that explicitly promote a product or service entirely at our own discretion. – Other comments that are deemed inappropriate. Thank you for your support in making the discussions on this blog a productive and enjoyable experience for all who read it. © Copyright: All rights reserved by Krishna De, Krishna.me.